Description: CSX C40-8W 7718 leading a south bound train through the yard at Manchester, Ga. Description: CSX Q-156 rolls southward across Iona Island on a brisk fall afternoon approaching Stoney Point, NY, with a backdrop of the Bear Mountain Bridge. Description: CSX 8755 leads a train east at Milepost 215. Description: CSX L326-12 heads east under the US-127 Off-Ramp for Trowbridge road. Description: Two days after seeing CSX 7718 and 8887 on L326-12, we see them again leading Q334-14 up the hill in the early morning light. Description: First pictures from Delaware! Northbound freight Q370 comes out of Welsmere Yard after dropping a small cut. Description: Q370 rolls eastbound out of Wilsmere Yard behind a YN2 C40-8W on a bright morning. Description: CSX general freight Q370 eases eastbound along the siding at Wilsmere Yard on the Philly Sub behind YN2 C40-8W 7718 on a bright morning. 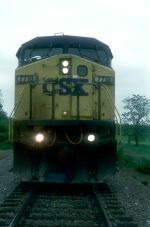 Description: Q500-30 heads westbound on track 1 on the CSX Garrett Sub. Description: A pair of Dash 8-40CW's in CSX colors at Camden's Pavonia Yard.